Nowadays, people are quite concerned about the interior and decoration of their homes. Curtains are an important accessory of every home as they have the impact to augment or diminish the desired appearance of any room. Curtains not only keep a room safe from the sunlight, but also help beautify it. Thus, you should choose curtains for your home that blend with the interiors of your home. 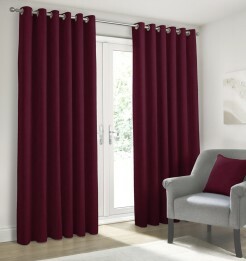 The right selection of curtains helps add visual elegance to any room. There are various options available for drapes. You can either purchase customized curtains or readymade ones. As the name suggests, readymade drapes are prepared in standard sizes and measurements. However, customized curtains are prepared to order according to the specifications given by the customer. Readymade drapes are usually the first choice of homeowners as they are less expensive than customized ones. Also, you can select from thousands of colour combinations and patterns. They are easily available in local and online stores. When selecting the fabric of readymade drapes, you can choose from various options including taffeta, silk, cotton, damask and voile. There is an endless variety of readymade drapes available in the market; thus you don’t have to compromise on the quality and design of your curtains. However, visiting a reputable store is highly recommended when purchasing readymade drapes since they have a great choice regarding pattern, colour and fabric. Small stores may not carry a big collection of readymade drapes and you may not be able to find ones to blend with the interior of your home. You can also look for curtains in online stores as they also carry large arrays of readymade drapes. Another advantage of purchasing curtains from an online store is that you can get imported items which may not be easily available in your city. Moreover, online stores often sell items at a discounted price. Every room of your home should have a different style of curtains since the same pattern and colour of curtains in every room may give a dull appearance to your home, especially if the interior and colour theme of each room is different. Heavy and elaborate curtains may not look good in your children’s bedroom and they would be very expensive too. It may be better to choose light coloured, lightweight curtains for your kid’s room with a simple design which is attractive for them. If you are looking to decorate your main room where you entertain your important guests, you can add heavy and rich curtains with intricate patterns. Your living room may have light coloured and simple curtains to allow sunlight to come in during the day. You can purchase blinds or café type drapes for your kitchen. Check the quality of fabric before you buy readymade drapes because you may not like to change curtains too often. Consider your needs before choosing readymade drapes for your home and buy curtains keeping in mind the utility and interior of each room. Abbie is an interior decorator. She helps people decorate by advising on the right colour theme for their home along with the right combination of other accessories including furniture, readymade curtains and lamps. I hope to buy new drapes soon as what we have was given to us by MIL and theyre worn out and torn. You gave me an idea about the color coz we have white interiors. Thanks!